How did Debbie get on that end of the camera? Our busy photographer played in only one heat as she made the rounds taking pictures. Laurel Stokes moves in the first heat of Euro Rails. Finalists Chuck Foster (left to right), Winton Lemoine, Harald Henning and Rich Meyer battle it out in Euro Rails. Winner Scorns Spain and the Superfreight!!! The BPA's new rules for MESE (Multiple Entry/Single Elimination) tournaments put us in a quandary as we had to determine the number of semi-finalists before we knew the number of first round games. We set the Semi-Final at five games of five players each to avoid denying potential winners a seat at the Semi-Final. That choice turned out to be fortuitous as we wound up with 23 first round games and 21 winning players. 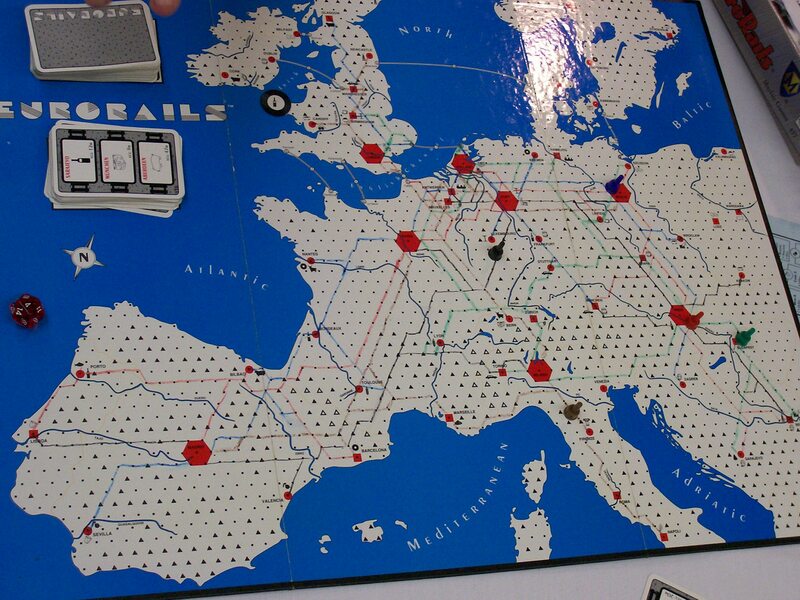 Discounting Nippon Rails, every Empire Builder variant was played during the tournament. Thanks to Assistant GM Bob Stribula, we were able to test drive his development copy of Martian Rails during the tournament. John Clarke, Chuck Foster, Harald Henning, Winton Lemoine and Rich Meyer won their respective Semi-Final to advance to the Final. Chuck, Harald and Rich had all been there before as veteran railroad competitors. John was a relative newcomer this tournament, joining us from the Grognard room across the hallway, where he spent most of his convention time playing classic hex-style wargames. 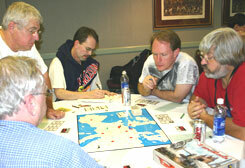 Winton was also a newcomer to the rails tournament, spending most of his convention at the Euro tables. The Tax Card came out early in the final. Rich and Harald owed $10 in taxes and were the only players to be penalized. Rich played a frugal game and was the only player not to upgrade to the Superfreight. Rich only made one trip to Spain during the game, and that was to satisfy dual demands for Steel and Potatoes to Valencia. Rich elected to be frugal again and not build into Spain. Instead, he rode Chuck Foster's line three turns in and out of Valencia. The money Rich paid to Chuck appeared to give Chuck the edge, as he was just a few dollars short of victory and on his way to make his final delivery. But Rich shocked the table when he announced his unexpected and unconventional win. (Click here to see 2006 Final mapboard. Rich's network is the green line.) The final results were Rich Meyer 253, Chuck Foster 242, Harald Henning 228, John Clarke 191, and Winton Lemoine 173. 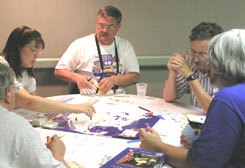 Questionnaires were distributed during both the Empire Builder and Rail Baron tournaments to get player feedback on support for a BPA-sponsored Train Game Mini Con and changing the Empire Builder tournament into a Swiss style Pre-Con event. The results of the questionnaire were strong support for a Mini-Convention and mixed support for the Pre-Con. We will be approaching the BPA with a Mini-Con proposal shortly. The majority of the opposition to the Pre-Con was based on additional days of attendance. 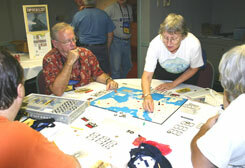 The majority of support for Pre-Con was for the multiple-mapboard, Swiss-style tournament. Based on how many of our players played in two or more heats (some even after qualifying for the semi-finals), we're looking to change next year's format to a multiple mapboard Swiss-style tournament that would run from Tuesday morning through Wednesday afternoon. The new format would be a five-round, Swiss-style tournament with the best three or four games counting so you wouldn't have to play in all five rounds. Players could play any variant they want but only one game on each mapboard will count towards the player's total score. While it will take more player time in the initial rounds we will save some player time by eliminating the semi-final and final. I'd like to hear any feedback, pro or con, on the proposed new format via e-mail from my players.